Join thousands of project managers worldwide who have enhanced their careers with GBMC Public Courses. 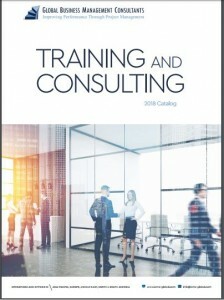 Click below to download a catalogue with a full list of our training programs. “It was a pleasure to meet such a great trainer as you are and discover the interesting and exciting world of the project management. I am very happy to have done the training which will be very useful for me to take the next step in my career path. Again, loads of thanks and I hope I will have you again for the other two courses that I will surely attend in the near future!” P.S. I loved Brussels and its atmosphere!!!! “Thanks very much for the great training– it was very helpful. You will be pleased to hear that my colleagues & I are already working on the Project Charter, so I’m sure we will be back to you with a few more questions, once we get a bit further along with the project planning.. but first we need to “sell “ the project, identify an effective sponsor and get the high impact stakeholders on board!